It seems as if the Nokia Lumia promotion is never going to get over. 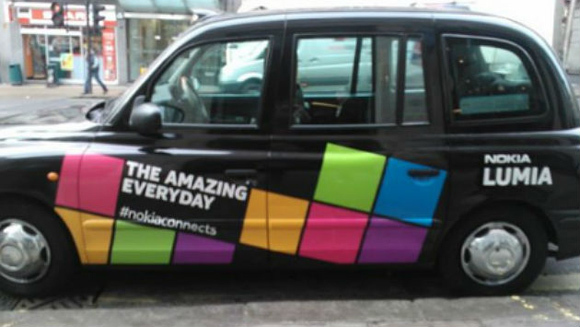 As if hosting the Nokia World event or paying for free live performances wasn’t enough, Nokia has sponsored free rides in London’s famed black cabs to promote its Lumia 800. Should you be in London, don’t forget to avail this facility. The cab sponsoring is also part of the Social Media week 2012, which Nokia sponsors. The company has also posed for pictures on Twitter and decorated the vehicles in such a fashion that you will know when you are hitching a free ride. Coming back to India, while we certainly hope that Lumia provides us free taxi rides, even we have seen a lot of Lumia promotion. First up Nokia gave the first 100 buyers of the Nokia Lumia 800 a free Xbox. Secondly, they had compensated the toll tax at many places such as the DND flyover. And a free event wouldn’t cause any harm, will it? It seems Nokia is leaving no stone unturned for the Lumia promotion. We hope that this promotion also results in sales and Nokia finally posts a profit net quarter. But till then, stay tuned for any and all updates on the Lumia.